Who wants to spend their free time in the Dry Cleaners after work or on the weekends? Ever wondered if there was a better way to handle this? Well, now there is! 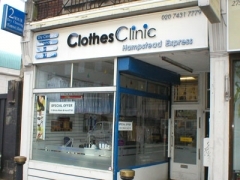 Clothes Clinic Hampstead Express who provides a premium on-demand Dry Cleaners in Hampstead services that has simplified the lives of thousands of Hampsteaders.